If you have been thinking that food storage companies are all the same... you may be right. Of course, every single one of these businesses will say that they have the best product, are the best value, have the best ingredients, etc. Are they wrong? Or are they right? Confused yet? If not, keep reading. The key to long term food storage is not as simple as it may seem. It's actually quite complex. Which makes this comparison even more challenging. Heavy duty Mylar pouches, flushed with nitrogen or added oxygen absorber and freeze dried or dehydrated foods is just the beginning of this story. Quality ingredients must be sourced, recipes made, product tested and certified, GMO or NON-GMO, GMP practices established, calories counted, servings determined, etc. Some of these business listed below that I have been comparing, co-pack and some of them source their own products, create their own recipes and package their own products. Co-pack means that another business has already gone through the entire process I listed above and then licensed their product under different names or private labeled their product for different companies. There are other slight variations on the co-pack as well. These are the companies that I chose for this evaluation. There are many others out there but I had to draw a line at some point. This has been taking long enough for me to try a good variety of each of these brands in order for me to get a large enough sampling to formulate my own opinions on taste and other factors that I will expound upon a little later. For this evaluation I focused primarily on entrees as they tend to be the meals with the most diversity of ingredients and widest variety of meals. I do not feel that a detailed or scientific comparison is necessary or even valuable in order to give you my observations and provide you with my opinions. Will small variations or details make a difference in deciding which are/is the best choice for our family? I didn't and still don't think so. This was not simply a taste test but rather an attempt to educate myself about the industry and determine what is really important with these types of foods with the goal of making some good choices. Shelf Life - 25+ years. Freeze dried and dehydrated foods can only achieve at most a 30 year shelf life if the manufacturer has removed all oils and fats. Oils and fats in foods add flavor, add taste but they will shorten the shelf life. These foods typically don't taste as good as those with a shorter shelf life. These meals typically have the lowest cost per serving. They also typically have the longest cooking times. Shelf Life - Up to 25 years. This is a questionable category to me. Of course, the shelf life of all of these products depends upon the temperature of the area where they are stored. Under ideal condition the product will likely reach its estimated shelf life. Shelf Life - Between 3, 5, 7 or 10 years. These types of meals are the most tasty of any others because they don't take out all of the fats or oils like the longer shelf life meals. Similar to the category above but typically set apart by their realistic shelf life rating that does not have an asterisk indicating "*up to". The cost per serving of these meals can go up dramatically. Some of these meals require only adding boiling water while others require a short cooking time. Prep Time, Just add boiling water - These types of meals are usually packaged in a Mylar bag and typically have a shelf life of between 3 and 7 years. Boiling water is added to the bag, it is resealed and then allowed to sit for several minutes after which it is ready to eat. Shorter cooking times allow you to use less fuel to prepare your meal. In an emergency situation when fuel can be in short supply this is a big benefit. Packaging - The two methods to achieve a 25 year shelf life are #10 cans and heavy duty Mylar bags. Many companies place Mylar bags into a secondary bucket or pail. While this may seem to be a factor at extending shelf life it really isn't. "Plastic is not an oxygen barrier." That's for those of you who are 'Tremors' movie buffs and Burt Gummer fans. Once either is opened the shelf life become approximately 1 month. Individual Mylar bags can be more convenient as they contain smaller portion sizes than #10 cans, thus you don't have to be as concerned about the shelf life after the package is opened. If you have a large family this is not as big of a concern as if you are single and don't want to have to eat the same thing every night until the large can is gone. Some companies not only package meals but also individual ingredients such as pastas, cocoa, sugar, vegetables, meats, spices, etc. so that you can make your own meals. Yet another option available is to freeze dry and package your own recipes and foods. I will talk more about the Harvest Right freeze dryer in a future blog post. I sampled some foods that were freeze dried with their machine and all that I will say at this point is that the results are... fantastic. Taste is obviously very much subjective. 25 year shelf life. Because I am 'spoiled', like I suppose so are many of you, with being able to prepare meals with either fresh foods or 'boxed' packaged meals, or eat at a favorite restaurant, my family and I get to choose to eat only that food which we find tasty and satisfying. Comparing the taste of our everyday food with food that has been prepared specifically to last at least 25 years is not a fair comparison. If you do this you will be disappointed with them the vast majority of the time. Comparing the taste of meals that have the same shelf life rating is the right way to do it. In the 25 years and over category my opinion, for the most part, is that they are all pretty much the same, with slightly varying tastes/flavors. There are a few dishes that stand out as exceptional. Keep in mind that I have not tried every single meal, flavor, entree, lunch or breakfast from each of the companies I listed above. I will highlight a few of my favorites below. Also, keep in mind that many of the different companies listed above do not offer products in each of these shelf life categories I listed above. Shorter shelf life: Most everything that I was able to prepare and try in this category was either Very Good tasting or Excellent. Flavor is the biggest variable. Along with the shorter shelf life these meals also have a higher cost per serving. This can be the most deceiving part about food storage. The marketing strategy of some food storage companies is to squeeze out as many servings as possible to show higher value. I prefer to look at calories instead of service size. A typical serving size for everything I tried averaged 249 calories per serving. Based on a 2000 calorie diet that ain't gonna cut it for me if I buy my food storage based on 3 serving per day. During an emergency it is likely that you will be expending more calories than during a typical day at the office. So, I plan for calories and not serving size as it has been my experience that any and all meals based on serving size do not provide enough calories for my active lifestyle. 800 calories per day is a survival portion and you probably wouldn't be very happy being hungry all of the time, unless you needed to lose a bunch of weight. I actually do consider the minimal spare tire I carry around my waist as my 72 hour kit. If you have a very lean physique you won't have much in the way of fat reserves to carry you along but being more than just a little overweight isn't a good idea either. Use serving size as a guide, not a hard rule. Plan on buying more meals if you go this route to compensate according to what your daily calorie needs are. Also, keep in mind that children do not need as many calories, but, depending up on the shelf life of the food it will still be good to eat when your little children become full grown. How important to you is it to have freeze dried or dehydrated food that is NON-GMO? If you are only purchasing a 1 year supply will it have much if any effect on your health? Did you know that the majority of the ingredients used to make up these long term food storage meals are primarily non-GMO? Very few of these companies can and do advertise their products to be GMO free, as they have to pay to have them verified and also produced in a certified facility. However, most of the companies that I worked with as part of this comparison said, and can provide verification, of individual non-GMO or organic certifications for the vast majority of their ingredients. They can not advertise them this way as either they did not want to pay additionally for the certifications or that a very small portion of their ingredients would not pass the organic or non-GMO testing or the facility did not meet the specific qualifications. In short, am I worried about only choosing products that are certified to be GMO free? Not at all. Ask a few questions about this to whomever you are considering purchasing your food storage from and you should get similar responses. The problem of long term food storage is not solved by one single simple solution. I don't believe that any of these companies will tell you that all you need to do is buy their stuff and you'll be set. Don't assume or come to the conclusion that if you buy a years worth of food from any long term food storage company that you'll have everything you need. All of the companies and products that I compared are good. Good enough to keep you alive and fed. When you're hungry most anything will taste good, and you'll be grateful for it. 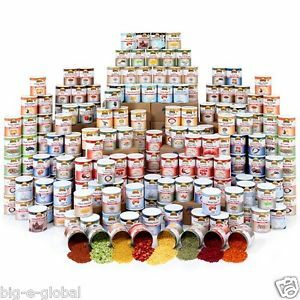 However, if you plan on only buying enough freeze dried 25 year food storage products for an entire year for your entire family you will be sorry. Will any single one of these companies products do the job of taking care of your families nutrition and comfort food needs? For myself and my family the answer is no. Our plan for long term food self sufficiency includes keeping a 3 months supply of everyday foods that we rotate on our shelves. This ensures a smooth transition to our long term food storage supplies. Quick and easy to prepare freeze dried meals are an important part of a balanced preparedness plan. Our plan includes 3 to 6 months worth of these foods for the whole family and we will then expand it from there. Be picky about what you will and won't eat. Many of these companies have a limited variety of products. Many of them have foods that you may not like the taste or texture of. That's life. I did not like ANY of the chili's I tried during this comparison. Could I eat them? Yes, definitely, especially if I was really hungry. Were they terrible? Not at all. Would I rather stock up on a few cases of Nalley chili and keep them rotated? Uh, yeah! Especially knowing that the dates placed on cans are "best by" dates and not expiration dates. If it's not bulging it is still good to eat. Recently a can of food that was over 100 years old was tested and found to still be edible. It is also important to stock up on bulk foods like wheat, rice, oats, and other foods that you know how to prepare and will eat. Another important aspect of being properly prepared is to have your garden in place and know how to can foods. Utilizing all of these aspects of food storage will ensure that an emergency situation doesn't have to be a life threatening experience. Don't buy all of your food storage from one company. Try several and buy from a few. Foods that our family enjoys most are pastas, potatoes, rice and soups so we are likely to enjoy these types of freeze dried meals most. Rather than a fancy freeze dried rice meal most of our kids would prefer a little butter and salt on a bowl of rice thus it makes more sense for us to stock up on pails of rice. Choose a good selection of the tastier shorter shelf life meals that you can eat regularly and rotate them. Select a few of the lower cost, longer shelf life companies, buy what you are most likely to enjoy. Most of these companies were very generous at providing me with some or lots of their food to taste at no cost. Some of the food I liked, some I loved, and honestly, some I just plain hated. However, their generosity tells me more than a simple taste test could. Thanks to all of you who participated. Each of these companies have their strong points and benefits and they are all a little bit different. This review was meant to give only a 'birds eye' view. You may love the chili's. Personally, I didn't. Grab-n-go: Best value. Good tasting, shorter cooking times, The Cheesy Rice Casserole was Very Good. Lower Cost. Mostly GMO free. Numanna - Strong flavor. Good reputation. Solid value. Many GMO-free. Family Storehouse - Best value NON-GMO certified. Quality product quality business. Good tasting. Saratoga Farms - Very good value. Very good taste. Longest shelf life ratings. Emergency Essentials - Widest variety. Excellent value. Auguson Farms - Wide variety. Very good value.